The slider Door is made up of two (or more) sashes that slide horizontally, to the left or right, on tracks. The door can be made wider and taller with the addition of sashes.The sliders work on a ‘ride over’ mechanism. 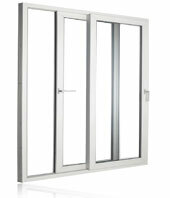 The casement door opens inwards or outwards with the help of a sash that is fixed on outer frame. Green Heritage can offer complete solid upvc doors as well as half solid half glass door according to the requirement. It is well suited for kitchens and baths.